Our knowledge of the Highlands in the Middle Ages has many frustrating gaps. It is also a time where the Highlands has a very different outlook than elsewhere in Scotland. The north was part of the Norse empire, with links to Orkney and Norway. In the west, the Lords of the Isles were fairly autonomous, merging Norse and Gaelic traditions. To the south the Earls of Moray lost out to the Canmore dynasty, and the history of the Middle Ages is the gradually encroachment and consolidation of the Scottish kings. The Scottish kings, particularly from David I (reigned 1124-53), introduced a number of institutions we consider part of the medieval culture, including coinage, castles, church organisation, and the foundation of burghs. We know very little about medieval burghs in the Highlands. Excavations at Inverness have given some information, but were patchy and small scale. The Cromarty Medieval Burgh Community Project, led by Stephen Birch and Mary Peteranna, ran from 2014-2016 and has helped to fill in this picture. 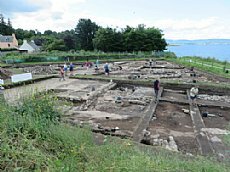 Community excavations in Cromarty on the shore uncovered some post-medieval buildings, but also much medieval evidence and medieval building remains. In the post-medieval period settlement shifted in Cromarty, which meant it was possible to have large scale open excavation which provided evidence of a number of phases of occupation. Evidence on buildings, pottery, trading links, daily life and the environment during the period was recovered, providing a valuable insight into Highland medieval burghs. A bone tuning peg from an instrument, probably a harp, is one of only two known from medieval Scotland. Ceramics show faraway contacts with England and the Low Countries, but also a local produced medieval redware. Fish were probably an important export. Since the excavations finished in 2016 there has been a wealth of post-excavation work. Radiocarbon dating showed that the burgh was flourishing from the 11th century, despite the fact our earliest documentary evidence is later. Details of initial work have just been posted on the HER MHG51786). The finds are in Cromarty Courthouse Museum pending eventual distribution from Treasure Trove. The website for the project also provides information about the project, including some specialist reports and pictures of many of the finds. A popular book with illustrations is currently in preparation. Much of the rubbish from the medieval burgh was clearly cleaned out and dumped on surrounding fields. Over the years medal detecting and field walking have also yielded further finds from this period, including seal matrix and harness pendant.